"The Common Core State Standards for English language arts/literacy (ELA) define what a student should know and be able to do when they complete each grade. Their purpose is to ensure that all students, no matter where they’re from, graduate from high school with the skills and knowledge necessary to succeed in college, their career, and their life as a whole." These skills can be broken down into a number of critical areas, all of which are addressed by AceReader. "The ELA/literacy standards highlight the growing complexity of the texts students must read to be ready for the demands of college, career, and life. The standards call for a staircase of increasing complexity … [and] … outline a progressive development of reading comprehension so that students advancing through the grades are able to gain more from what they read." AceReader uses both sentence length and vocabulary difficulty to measure the level of each of the readings in 13 levels. Levels 01-03 are leveled according to the Spache word list, Levels 04-13 use the Dale-Chall word list, and all readings are cross-referenced with the Frye Readability Graph to determine appropriate sentence and word length for each level. In addition, proper nouns or other unfamiliar words are specially marked to aid in accurate leveling and are presented so the student can understand the words from the reading’s context. Each level is more difficult than the one preceding it to allow for a growing complexity of material. In addition, like the Lexile Framework for Reading, AceReader uses the benchmark of 75% comprehension or above as the acceptable result for determining whether or not a student understands the material read. And, as with Lexile reading, the themed Test Sets and varied e-books help match a student with material about which they are interested, keeping them engaged and more likely to succeed at both reading fluency and reading comprehension. Informational texts play an important part in building students’ content knowledge. Further, it is vital for students to have extensive opportunities to build knowledge through texts so they can learn independently. Fulfilling the standards requires a balance between informational and literary reading. Informational reading includes content-rich non-fiction in history/social studies, sciences, technical studies, and the arts." AceReader contains a generous mix of literary and informational texts. The General Test Set, composed of 260 readings at 13 levels, relies on literary work and storytelling for a large percentage of the lower levels, e.g. Levels 01-03. As the levels increase in difficulty, the program provides more informational text, sometimes a constructed, topical reading and sometimes an excerpt from a well-known document or book. In addition, the Specialty Test Sets are divided between informational stories and more detailed non-fiction works. Topics include American History, Earth & Space Science, Famous People, Fun Facts, and SAT-ACT Prep. AceReader also comes with a library of e-books, which contain a mix of myths and legends from around the world, classic literature, biographies, historical documents, the natural and social sciences, and critical essays from a variety of disciplines. Every attempt has been made to include a wide variety of themes, lengths, and degrees of complexity so that all students, no matter what their level, can find material that interests them and helps them to build content knowledge. "The reading standards focus on students’ ability to read carefully and grasp information, arguments, ideas, and details based on evidence in the text. Students should be able to answer a range of text-dependent questions, whose answers require inferences based on careful attention to the text." Each reading in the AceReader program is followed by rigorously crafted text-dependent questions and answers that increase in depth and breadth of complexity as students master their reading skills. In the specially developed General (Core-aligned) Test Set, the program also includes more inferential and style-type questions beginning at Level 06; these question types are also present in all versions of the SAT-ACT Prep Test Set. The CCSS acknowledges that some students benefit from dynamically adjusting scaffolds that assist in the development of critical reading skills. As the students master their reading skills, these scaffolds are gradually removed to allow more independent reading. AceReader includes dynamically adjusting scaffolds that are determined by students’ baseline reading comprehension test results. Once students meet the minimum comprehension criterion, the Drills pace them at higher speeds relative to their own personal base reading speed. Drill pacing speeds continually adjust for each student in a manner that challenges them to progress to the next level. Students repeat the process of testing to ensure they are challenged each time they perform the Drills. The criteria used to determine the pacing speeds are defined by default settings that ensure comprehension while taking Self-Paced Reading Comprehension Tests. These criteria include ensuring students’ reading speed is not too slow or too fast, eliminating repeated tests, and making sure their comprehension is at least 75%. The parameters used to define the criteria are adjustable by the teacher. All scores are recorded in both chart and graph form for teacher review. As each student reads at a different rate, the pacing is personalized for each individual. All students work through one level then move on to the next to increase the complexity of the material to which they’re exposed. Once proficient at a given level, they should be able to read other works at the same level independently. And as they begin to master the readings in the various Test Sets, they are further encouraged to read independently by referring to the extensive library of e-books included with the program, as well as by importing their own reading material. According to the CCSS, students must develop a base of general academic vocabulary to be able to access complex texts across many different disciplines. AceReader’s 960 built-in readings use vocabulary that would be introduced in appropriate grade level classes. Vocabulary at Levels 01-03 revolve around the Spache word list and at Levels 04-13 around the Dale-Chall word list. In addition, AceReader uses common (frequently encountered) SAT word lists for its SAT-ACT Prep Test Set. The program increases the degree of difficulty of the words included in the readings as the level increases to assure both progressively difficult vocabulary and accurate leveling. The readings consist of a variety of subjects and styles – both in the General Test Set and the Specialty Test Sets – to ensure that words can be understood across different disciplines. The CCSS emphasizes the need to expand students’ vocabularies through the act of reading. To increase and develop students’ vocabularies, AceReader uses leveled Reading Comprehension Tests that revolve around commonly used vocabulary lists (e.g. Spache, Dale-Chall, Frye, common SAT words). Each level uses words and phrases that are more difficult than the preceding one. Students must learn these new words, either from context while reading or from definitions provided within the body of the text. Students encounter many of these words throughout the various Test Sets, which allows them to see and use the words in different contexts. 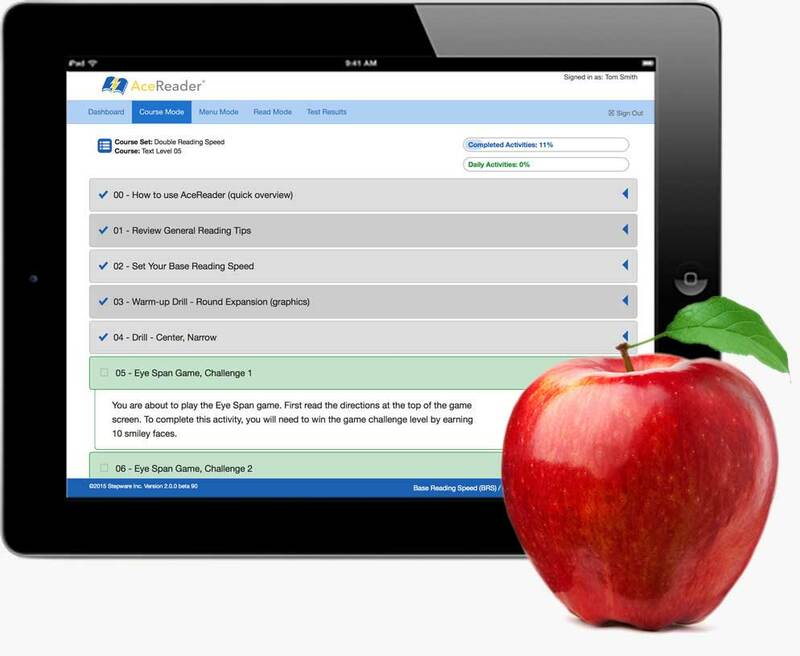 In addition, AceReader contains a Flashcard Game that includes leveled vocabulary and SAT-ACT Prep flashcard content. This Game also allows teachers to introduce new vocabulary that will be used in upcoming readings, in specially constructed material they import into the program or content they otherwise introduce into the classroom. By reinforcing the material through repetition and a fun learning situation, the Game also helps students transport these words to independent reading exercises. AceReader also develops the skills of learning new words as a sight word reader. Depending on the presentation mode, words may be flashed on the screen, scrolled, or highlighted, at ever-increasing rates. The student has to determine the meaning of the text quickly, as the program paces them so that they cannot regress (re-read text). In addition, the Eye-Span Game and the Eye Span-Comprehension Game require students to compare words flashed briefly on the screen and to determine if they are the same or different, either in structure or in meaning. In this way, they can learn to recognize and understand more and increasingly complex words at a glance. In addition, teachers can create their own readings with any specialized or targeted vocabulary lists, or they can import outside material into the program for student use. "Students employ technology thoughtfully to enhance their reading, writing, speaking, listening, and language use." AceReader is an interactive technological tool, one geared to the process of reading. It allows students in this highly technical Information Age to learn how to read online (or from a computer screen) as well as from a printed page. And with 830 Reading Comprehension Tests and 625 e-books, it provides ample material on which to learn new reading skills and to practice them to perfection. AceReader is the only program that uses time-tested, patented and research-based technology with a 15-year proven track record, and it has won 50+ prestigious education and technology awards, such as Technology & Learning, BESSIE and EDDIE for innovation and educational excellence. It is sophisticated, yet fun, and it includes educational games to help make the technology more accessible to today’s video game-oriented learners. In addition, AceReader contains a text-to-speech feature. This provides students with a multi-sensory reading experience – they can both see and hear the words as the program flashes or highlights the words. While this feature is normally used to help enhance reading fluency at the lower grade levels, it can also be used at the higher levels to develop listening skills. Students listen as the text is read to them then take the Comprehension Test that follows to determine how much of the material they understood. As a reading tool, the program does not contain a writing section, but following a Reading Comprehension Test, teachers often have the students pull up a word processing program to 1) summarize the text just read in their own words; 2) answer inferential questions or address evidence and text-based prompts; and 3) derive narrative material based on the content of the reading just covered. The teacher or administrator can access that summary and assign a comprehension score based on the student’s level of understanding of the presented text. Since students are exposed to readings of varied content and styles, they can apply these factors to helping develop their own writing skills. Teachers can help enhance the students’ learning experience by creating their own Tests, Drills, and Games. Each of these tasks requires the students to engage with the program on a different level. Each also allows teachers to customize the content with the built-in readability formulae and can lead to teacher-derived prompts for writing exercises. Because of its numerous presentation modes, AceReader has also been proven as an effective technological tool to help readers with special needs process information more effectively and become proficient at reading. These needs include auditory disabilities, dyslexia, low vision, paralysis/eye fixation problems, and many others. Authors: National Governors Association Center for Best Practices, Council of Chief State School Officers Title: Common Core State Standards for English Language Arts. Publisher: National Governors Association Center for Best Practices, Council of Chief State School Officers, Washington D.C. Copyright Date: 2010.